Update: The Official Twitter app has officially started going live around the globe. Check your country’s App Store and let us know in the comments if its available to you yet. It’s almost certain that an official Twitter for iPhone app will be hitting the App Store soon with the recently acquired Tweetie 2 being removed from the App Store earlier today. There has also been an App Store link made live (although there is no page up for the app as of yet). This means the app itself could go live any minute. Twitter acquired Tweetie 2 back in April, so waiting until now to remove the app from the App Store would certainly point to the launch of an official Twitter app, although it may not be much more than a rebranded Tweetie 2 client. 9to5mac notes that Twitter has also previously confirmed a Twitter for iPad app, so this might possibly be released at the same time as the iPhone app. 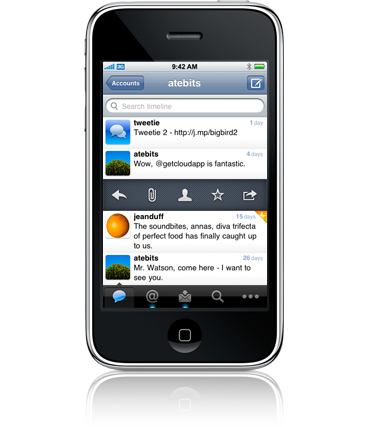 We are also expecting the official Twitter apps to be free downloads, opposed to the $3 Tweetie 2.